On this scenic road to motherhood, if we are to keep becoming more and more fertile, we have no choice but to stay busy being born. 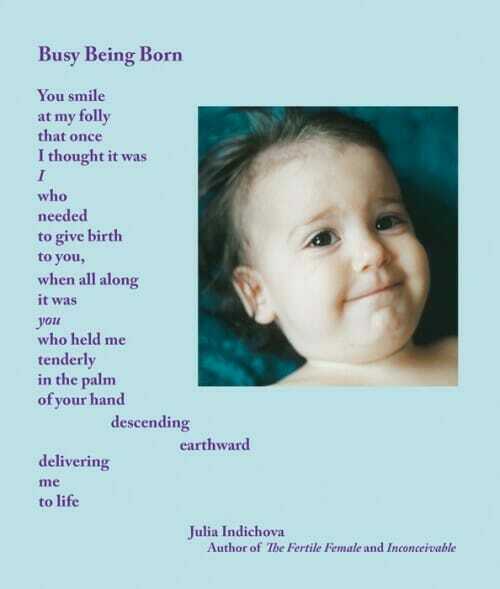 Which unborn part of you is calling to be born at this juncture of your baby journey? Since I found your work, I have found that there are many parts of me that are calling to be born…the me that is emotionally sensitive, intuitive and aware. the me that is vulnerable and can articulate and is willing to share my feelings, the me that is nurturing, the me that is spiritual, the me that lets go of control, and the me that loves myself fully. I think the part of me that is calling to be born is actually calling to be reborn. It is the fertile version of myself that was alive and kicking only a few short years ago. She is someone who does not define her success in life in comparison to others, and therefore is not jealous and defeated with each sighting of a pregnant woman, particularly one who is younger. She is creative, productive, successful, loving, and happy. She is excited by opportunities to engage in life and does not run from the world for fear of encountering the pain of seeing pregnant women, babies, and others whom she feels are more successful. She is someone who is an artist, and caring soul, and a visionary. …there are more parts of me drowsing, waiting to be born, calling to be unleashed – the part named ‘be true to yourself’, the part which prioritizes the private life to the professional life, the part which is dedicated, determined and persistent… I think this will keep me busy for a while, busy being born… Julia, you are the trigger. Thank you! The part of me that is calling to be born is open to all the gifts that life is offering, is fully present in the moment, is grateful, and accepting. She loves unconditionally and accepts people for who they are. She takes care of herself first and releases her responsibility for fixing other people. She lives without assumptions and expectations. She is open to divine guidance and wisdom. I truly love that poem. The part of me that is calling to be born is my voice. The one that is truthful and courageous for the real inner me. Not the one that hesitates in case it is not what someone else wants to hear. The voice inside me that is honest and only worried about how it will make me feel, not everyone else. Thank you for posing the question and the beautiful poem. As I said, being at peace with uncertainty – being content with taking steps toward what I think is best – being courageous enough to just take the steps and trust the end. What a wonderful poem. The part of me that is calling to be born is the “real me” or the “authentic me”. The part of me that I have dreamed of since I was a little girl. To follow my dreams, believe in me, and have the courage to follow through with my heart is telling me to do. To look forward and not backwards. To really go after what touches my heart and makes me smile. To just do it. To find a way to make my dreams reality, and not just the dream of another child, but the dream of quitting my job and being a full time mom with a more fulfilling career. Which unborn part of me is calling to be born…hmm…….well currently I am hanging to my UM’s voice that says, “You’ll get pregnant, don’t listen to anyone else, just believe me ! !” …….I just feel like I hugged my UM tightly and blissfully enjoying the ride not thinking too much about how, where or when will I land……just feels so good to trust (at the moment). Not sure if I was able to answer the original question though. Love the poem, wow! Now that’s a really good question. I don’t know which part of me is calling to be born. Maybe the me that is not afraid to be in love. I’m doing this as a single mom since the love of my life turned out to be not exactly daddy material. Love your books and what you created here, Julia. Maybe the workshop or one of your teleconferences are my next step. Thank you for your voice and your passion,it’s contagious.